The National Model Aviation Museum in Muncie, Indiana, is again hosting Black Wings: American Dreams of Flight, a Smithsonian traveling exhibition, in celebration of Black History Month, and running through March. 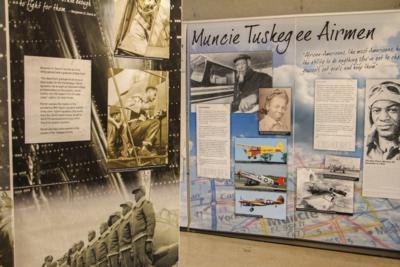 The exhibit was also open in February 2018 at the Muncie museum and many enjoyed learning more about the history of African-Americans in aviation. The Wright brothers signaled the arrival of the new age of aviation with their historic flight in 1903—sparking America’s new fascination with and exploration of flight. Although many African-Americans were enthusiastic about flight, they faced racial discrimination and were denied access to formal training to become pilots and mechanics. The Smithsonian traveling exhibition, Black Wings: American Dreams of Flight, chronicles a powerful group of aviation proponents who challenged these obstacles and created their own legacy in the world of flight. Black Wings opened at the National Model Aviation Museum on February 1, 2019, and will be on display through March 31, 2019 in honor of Black History Month. Developed by the Smithsonian Institution Traveling Exhibition Service (SITES) and the Smithsonian National Air and Space Museum, the exhibition was made possible by the generous support of the MetLife Foundation. The exhibition is based on the book Black Wings: Courageous Stories of African Americans in Aviation and Space History. The exhibit was created by exhibition curator Von Hardesty of the Smithsonian National Air and Space Museum. The Smithsonian museum, located in Washington, D.C., maintains the largest collection of historic air and spacecraft in the world. It is a vital center for research of the history, science, and technology of aviation and space flight, and memorializes the national development of aviation and space flight.